College Fest Event Ideas - List, Descriptions, PDF to Download and etc. Home Engineering College Fest Event Ideas – List, Descriptions, PDF to Download and etc. College Festivals are the events which students and staff take an active part once in a year. These college festivals consisting of many things like dance competitions, music competitions, paper presentations, poster presentations, games, stalls, fun and all. The main part comes in this college festivals are scheduling the day with events. In this posting, you can find the details about College Fest Event Ideas and list. Let us see in detail about the fest event ideas and all. This AD-SELFIE is one of the fun and interesting event in the college fest event ideas. As we know that everyone loves to take selfies. We have a famous saying that “A selfie a day keeps the doctor away.” Nice right. So the theme of this event the event organizing team will give you the names of some things. With those things, you need to take a selfie. Within the prescribed time students have to complete the task. Those who won this event will award with nice presentations. This app challenge event is like a technical event. In this event, students need to create an app with their own idea. In this students no need to use any coding techniques. Participants have to create the themes. By depending on the themes, the respective teams need to submit their presentation for the app. Organizing team and authority team will judge based on the creativity, problem-solving thinking, and user-friendly designing. The main idea behind this AD- MAD is to advertising. To advertise some products and services. A non-advertised product will be given to all the participants. Specific time will be given to the participants to complete the tasks. They need to create a video clip or Ad print poster to promote their products or services. In the next round, selected participants would be asked to recreate a failed advertisement. This is all about AD- MAD event. This Devil Follows is an innovative management game idea. The theme of this event is the authority team will give a lecture about how to work in a team & create team building attitude among them. Total 4 students have to participate in this game. A group of 4 students would have to do a task. In this event, Out of four members, three members would be blind-folded and the last member cannot speak. In a time span of 5 minutes, the students have to collect all the material. Then they have to make the product. In this event of Brand race, the participants need to create a brand from the scratch. They will have to create a plan of the brand and need to give a presentation about the branding plan to the judges. In the next rounds, the teams have to re-brand an existing brand & give the presentation explaining detailed strategies & plans to do this. If it is a brand manager you dreamt of then the brand race will make you reach there. In this event, an idea is having multiple participating teams. Students need to create an interesting on-campus murder story. Clues will leave at some places. Leave clues tracing back to the murder on the campus. The clues must be lead to the witnesses. Volunteers must be asked to role play. The one who finds the real murderer will win based on clues given. Participants need to create a background story and need to leave clues all around the campus. Some students need to act as dummy dead bodies. And have some volunteers act as witnesses. Teams need to create a backstory and have to leave clues all around the campus, along with dummies acting as dead bodies. QUIZ is well-known event idea. We can conduct quiz on many of the topics like Movies, Technical Concepts, Management, Startups, Books, General Knowledge, Computers and etc. Pick an interesting topic and prepare questions. Or you can say any topic of your interest and prepare questions on it and conduct quiz interestingly. For more College Fest Event Ideas Just CLICK HERE. Up to now, we have seen some college festival event ideas. 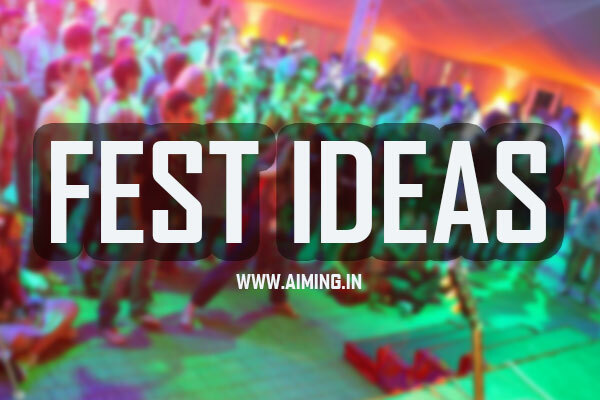 And some list of ideas which help you to conduct and organize in your college events. Just make a glance and get an idea. Have fun. Where can i get more information regarding mock cid?